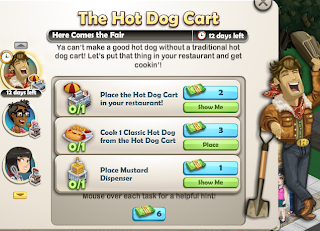 ChefVille Guide: New Hot Dog Cart Event! 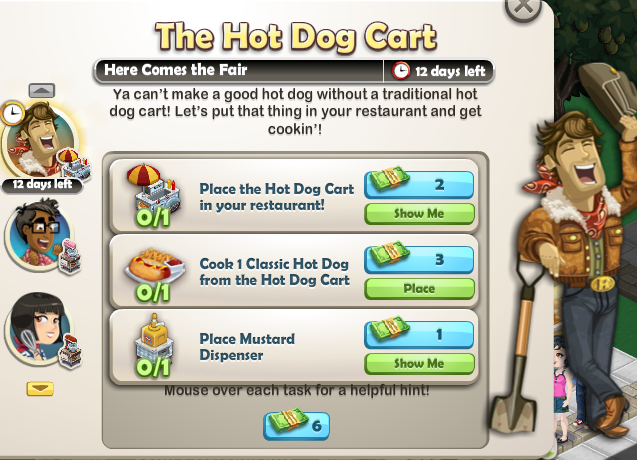 With the new Hot Dog Cart Event you will be able to create classic recipes such as the Hot Dog, The Works, Corn Dog, Spicy Veggie Chilli, Chicago Dog and much more. 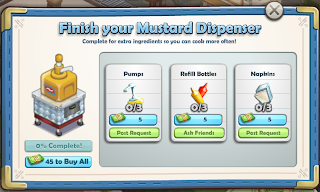 You will start out by placing your Free Hot Dog cart. Next you will have to cook a Classic Hot Dog (Ingredients: 2x Sirloin Beef, 1x Wheat Bread and 2x Tomatoes. You can get more beef by visiting friends Mom & Pop Stores. You can get the beef from the Mom & Pop Store, bread from the bread rack and Tomatoes from the Tomato vines outside. 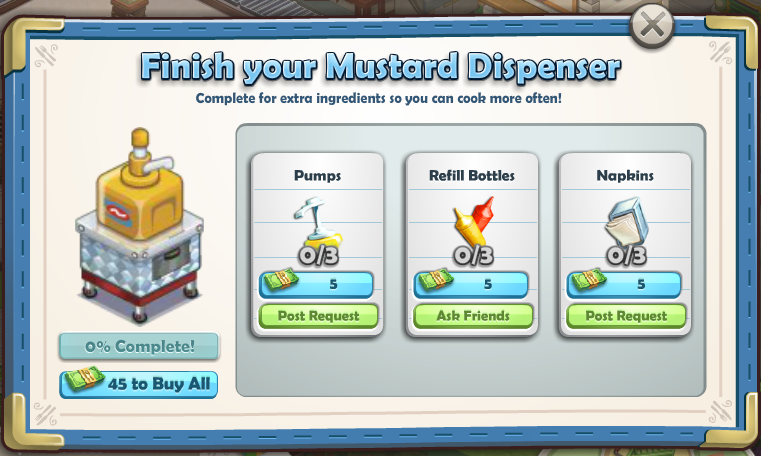 Next you will have to place the Mustard Dispenser and then obtain items in order to build it. It will require 3x Pumps, 3x Refill Bottles and 3x Napkins or 45 total Cash. You will have to post a request on your Facebook wall to get the Pumps and Napkins. Friends will then have to click the link on your Facebook wall to give you these items. For the Refill Bottles you will simply need to ask Facebook friends for these items. 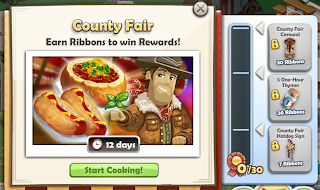 As you cook up meals at your Hot Dog stand you will earn Ribbons. 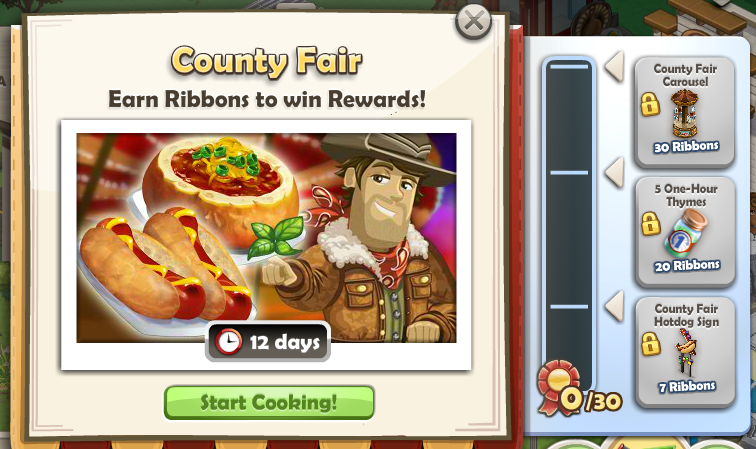 The more ribbons you get the more rewards you will win. Hope this helped! Please comment below if you feel there is anything else important to note about the Hot Dog Event and/or Ribbons in ChefVille. Thanks For Reading!